“Move over BMW M3, there’s a fat cat in town with a V8 supercharged engine producing 592 hp and 0-60 mph sprint time of 3.3 seconds. But there’s a catch, only 300 units will be produced. The XE SV Project 8 is developed by Special Vehicle Operation (SVO) division and can be lowered and adjusted for track use. 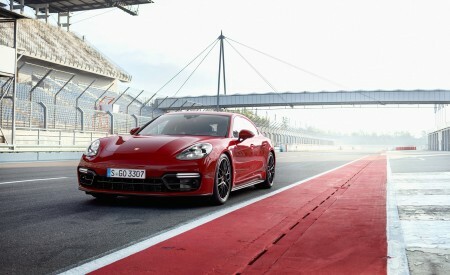 For more info on the 200+ mph sedan, check out the press release below:” Ed. 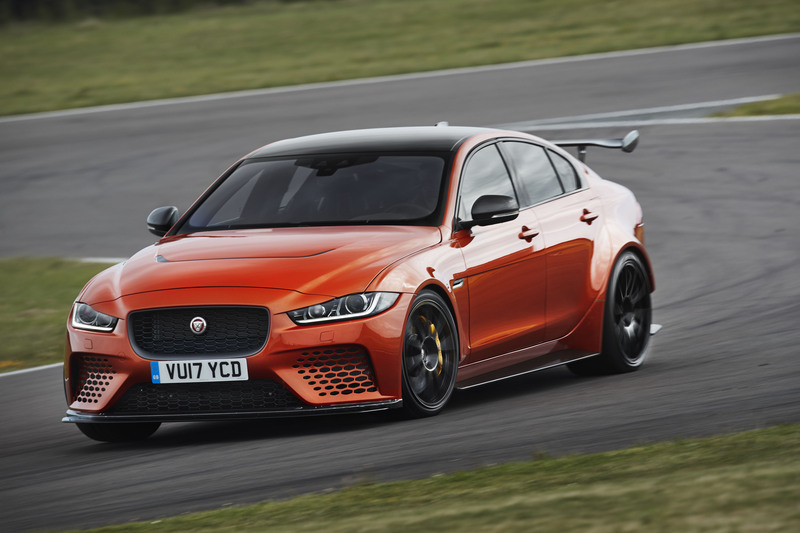 Jaguar Land Rover Special Vehicle Operations (SVO) has revealed the most powerful, agile and extreme performance Jaguar road car ever produced – the 200mph(1), 592HP Jaguar XE SV Project 8 sedan. 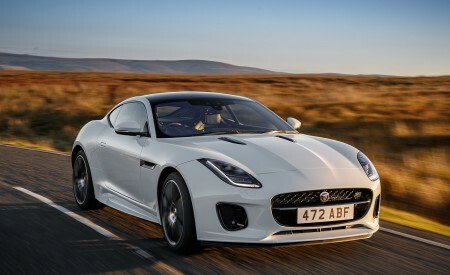 Following the successful F-TYPE Project 7 of 2014, the XE SV Project 8, the second Collector’s Edition by SVO, is a hand-built four-door sedan with supercar performance – designed to thrill driving enthusiasts, with an extraordinary combination of explosive power, dynamic agility and all-wheel-drive traction. No more than 300 examples will be created for global sale, each to be assembled at the SVO Technical Center in Coventry, England. The Project 8 exclusively features the most powerful version of the Jaguar Land Rover 5.0-liter Supercharged V8 gasoline powertrain. 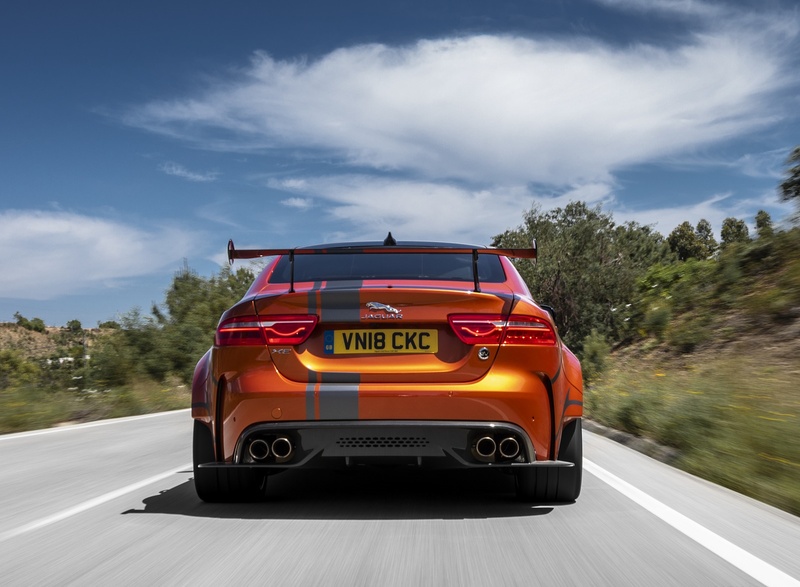 The 592HP power unit, which has a Titanium Variable Active Exhaust, is complemented by a standard All Wheel Drive (AWD) system(4) and motorsport-derived aerodynamics to deliver a 200mph top speed and 0-60mph in 3.3sec(1), making Project 8 the fastest accelerating Jaguar yet. Carbon Fiber Bumper with enhanced Cooling Ducts. 20-inch forged aluminum alloy wheels. 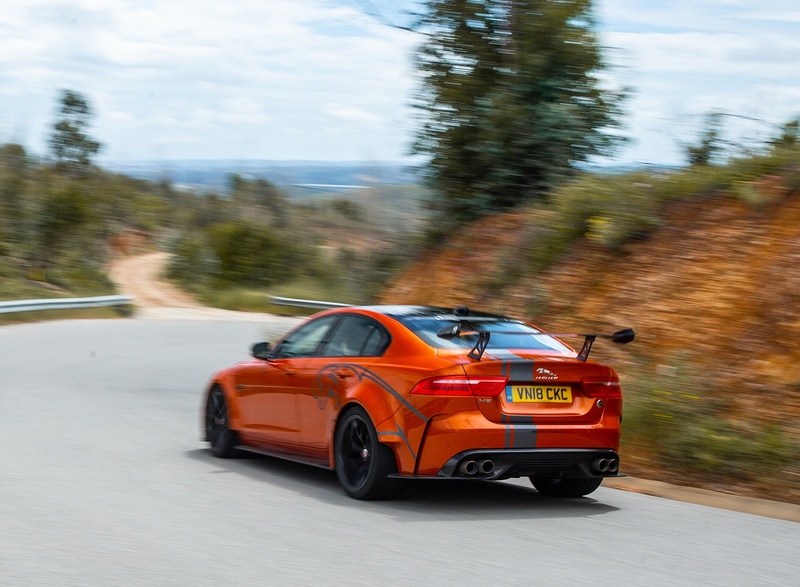 Globally, the Project 8 will be available in two- and four-seat specification. 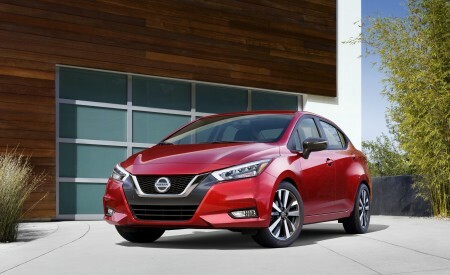 In North America the vehicle is available exclusively as a four-seat model featuring the brand’s latest front Performance seats with magnesium frames, plus a more heavily contoured rear seat cushion to maximize support. 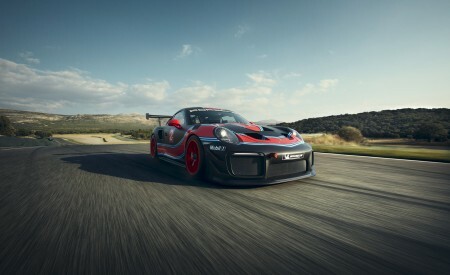 In some global markets, an optional two-seat Track Pack includes lightweight front Carbon Fiber Racing Seats with Four-Point Harnesses fixed to a Harness Retention Hoop in place of the rear seat. All Project 8 models will be built in left-hand drive configuration only. 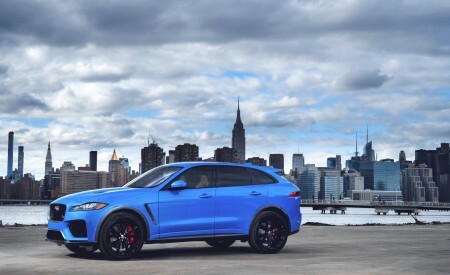 Full details of Project 8 are now online at www.jaguarusa.com, including eight body color choices – three eye-catching standard colors: Fuji White, Narvik Black and Caldera Red; plus five enhanced SVO Design options incorporating colors and finishes from the SVO Premium Palette: Valencia Orange, Velocity Blue, Meribel White, Verbier Silver and Corris Grey (satin matte). Owners of the Project 8 will also be able to personalize their car by opting for further colors and finishes from the SVO Premium Palette range, which includes 19 colors in tri-coat, tinted clear coat, pearlescent, ChromaFlair™ and satin matte finishes. Race-inspired decal packs, accentuating the high-performance attributes of the Project 8, are also available. 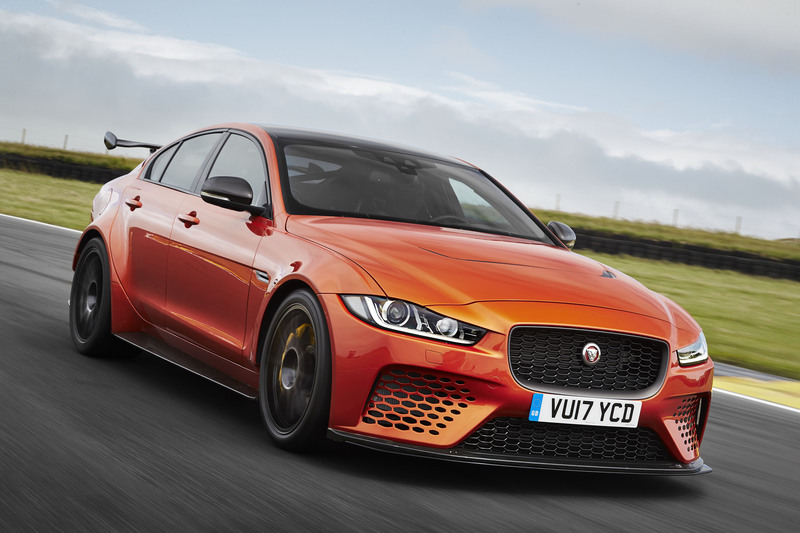 The Jaguar XE SV Project 8 will make its world debut at Goodwood Festival of Speed in West Sussex, UK, which runs from June 29 – July 2. 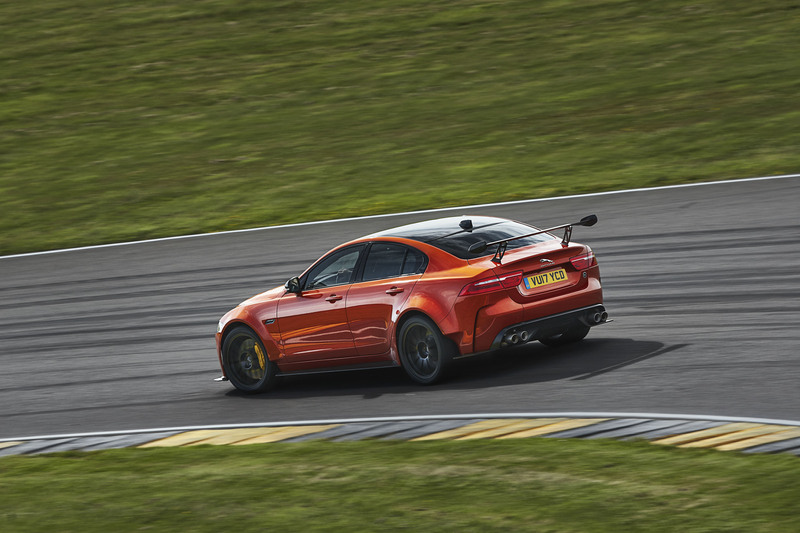 The Project 8 will make its dynamic world debut on the famous Goodwood Hill on Friday, June 30. 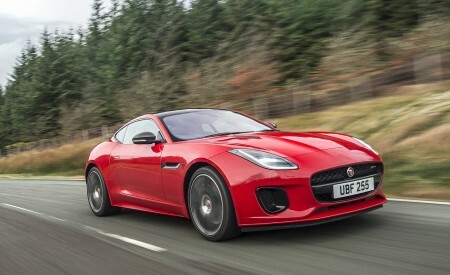 Jaguar has a rich history of producing stunning, aerodynamically-efficient cars. 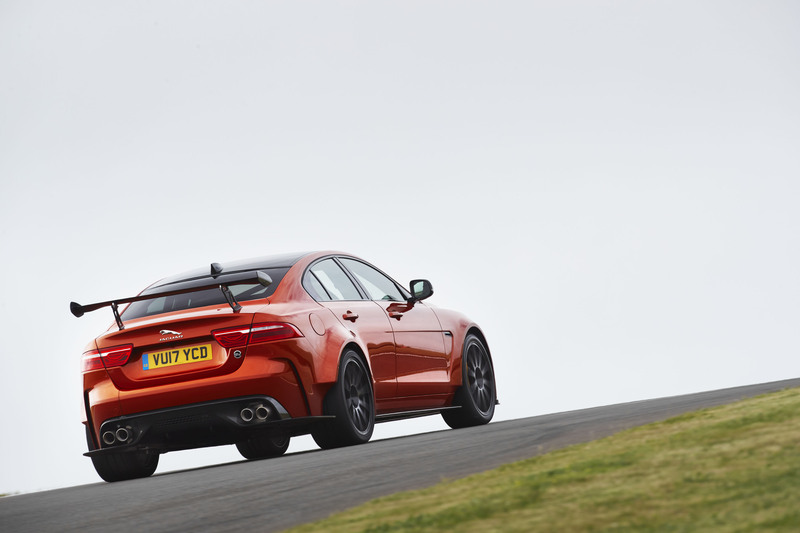 The XE SV Project 8 takes that tradition of uncompromised form and function to the next level, with purposeful bodywork revisions by the SVO design and engineering experts to meet the car’s 200mph(1) performance target. 2.2-in/55mm flared aluminum rear wing panels, to accommodate 305-width tires. Aluminum rear doors reprofiled with more muscular body flare. Reprofiled trunk floor to improve airflow through the rear diffuser. 0.7-in/19mm flared Carbon Fiber front wings with cut-away lower trailing edges, to accommodate 265-width tires and repositioned Xenon headlamp units. Manually adjustable two-position two-piece Carbon Fiber Front Splitter. Carbon Fiber Hood with integrated air extraction duct, saving 6.6-lbs/3kg over the standard aluminum part, reducing drag and aiding cooling. Carbon Fiber lower side skirts. Rear Carbon Fiber Bumper with drag-reducing airflow management creases and cut-away lower wheelarch trailing edges. Rear Carbon Fiber Diffuser with quad Titanium Variable Active Exhaust tailpipes. Manually adjustable two-position single-element Rear Aerodynamic Wing. Extensive rolling road wind tunnel and Computational Fluid Dynamics simulation testing has refined the aerodynamic package, which includes a Flat Underbody, to achieve a 205 percent reduction in lift with Front Splitter and Rear Aerodynamic Wing in Track Mode, delivering more than 269-lbs/122kg of downforce at 186mph(1). Every Project 8 gets unique badges on the Front Splitter and endplates of the Rear Aerodynamic Wing, plus an SVO roundel on the rear panel. Different accent colors for brake calipers, front grille surround, aerodynamic parts and mirror caps. Reflecting the purposeful nature of the Project 8, the interior is designed to emphasize the feeling of connection between the driver and the car, with minimal distractions or embellishments. In North America, the Project 8 is available only in a four-seat specification featuring the latest magnesium-framed front Performance seats with unique Oyster contrast-stitched Premium Jet leather bolsters and Miko suedecloth centers. Project 8 logos are stitched into the headrests. The rear seats, for two occupants only, are redesigned with additional lateral support built in to the seat squabs and bolsters. Helping to reduce reflections in the windscreen, black soft-touch Alcantara covers the instrument panel and dash topper. The same material is used on the door panels and rim of the Project 8-branded Sports Steering Wheel. Gloss Carbon Fiber detailing, mirroring its use for exterior components, extends to the Project 8-branded Tread Plates, the Riva Hoop incorporating ‘1 of 300’ Project 8 aluminum Commission Plaque, and the gear selector surround. In addition to aluminum gearshift paddles mounted behind the steering wheel, Project 8 features a dimpled leather-wrapped Pistolshift lever with Command Shift, giving multiple ways to select the desired ratio from the eight-speed Quickshift® transmission. Giving the driver all the required information on speed, revs and dynamic performance, whether on road or track, Project 8 features the latest virtual 12.3-inch TFT Instrument Panel Display with full-screen 3D Map View navigation(5), a 200mph-plus speedometer and Track Mode interface directly behind the steering wheel(1). As standard, the Project 8 is fitted with the 10.2-inch tablet-style touchscreen of the Jaguar InControl® Touch Pro™ infotainment system(6) featuring Dynamic-i, which adds a stopwatch, g-meter readout and accelerator and braking graphics to the central touchscreen display. 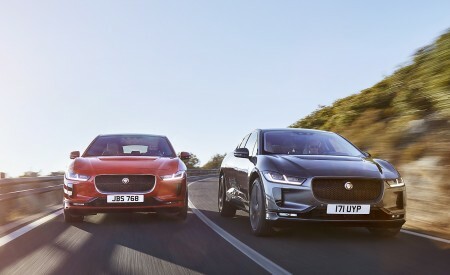 The Project 8 also functions as a 4G Wi-Fi hotspot, enabling up to eight devices to connect to the internet, and fully supports Jaguar InControl® Apps™(6). The Jaguar InControl® Remote™ app allows users of iOS® and Android™ devices to connect to the car from anywhere. The technology enables a range of functions, including checking how much fuel is in the tank, unlocking or locking the doors, and seven-day timed pre-setting of the climate control system. A superb 380W MeridianTM Sound System developed specifically for the Jaguar XE features 11 speakers (including subwoofer) and incorporates smart functions such as ‘Play more like this’ which automatically compiles playlists, or Music Queue, which makes it easy to search for and place songs, albums or artists into to a music queue while the current track is still playing. As well as media streaming from smartphones and tablets via two USB ports, Touch Pro™6 offers AM/FM/HD Radio and Bluetooth®. The system also supports satellite radio, and delivers features such as buffering, enabling users to skip back to the start of tracks. 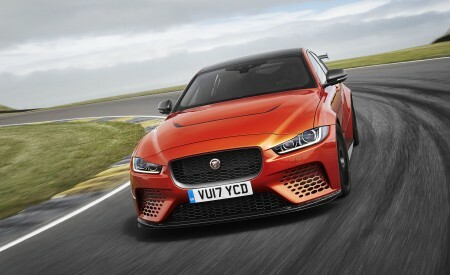 At the heart of the Project 8 is the latest evolution of the well proven Jaguar 5.0-liter Supercharged V8 engine modified to give a targeted power output of 592HP and 516-lb. 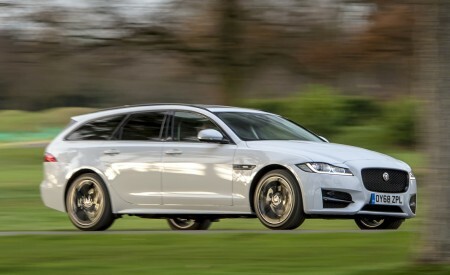 ft. of torque – the highest output of any Jaguar road car. To achieve the outputs required for a 200mph(1) performance sedan, SVO engineers have tuned the engine calibration software and enabled better breathing on both air intake and exhaust sides of the engine. The air intake system is unique to the Project 8 and is optimized to increase airflow efficiency and reduce air circulation and pressure drop within the airbox. It’s fed by ducts in the front Carbon Fiber Bumper molding. 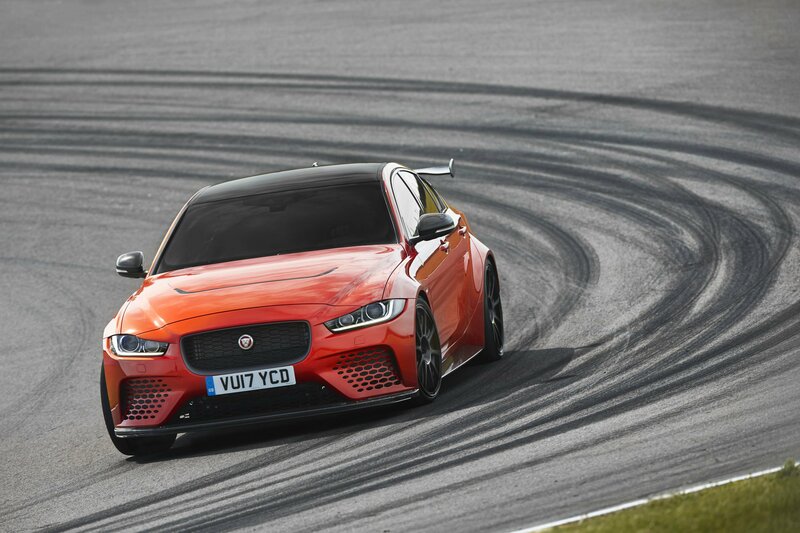 The Project 8 uses a unique lightweight Titanium Variable Active Exhaust designed to provide consistent performance during extended periods of track use. The system exits through the rear diffuser, finishing with quad 3.5-in/89mm tailpipes for a phenomenal snarling soundtrack. The cooling system of the V8 is extensively modified, ensuring stamina and endurance under extreme track conditions and in hot climates. The vent in the Carbon Fiber Hood plays an active part in managing under-hood temperatures as well. Located in a low-pressure area, the vent has a dual benefit of reducing drag and helping manage the airflow through the engine compartment by sucking hot air out. 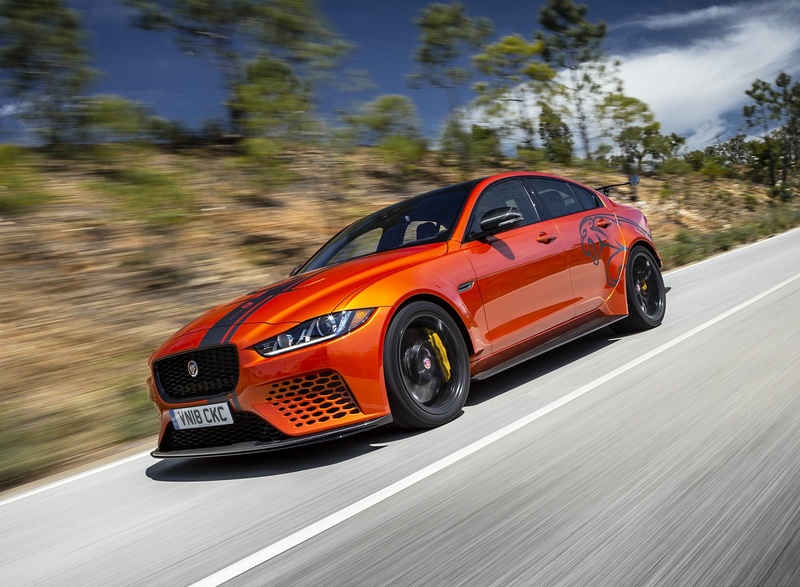 To enhance traction and delivery of the 5.0-liter Supercharged V8’s power and torque specification, the Project 8 utilizes a re-calibrated version of the brand’s eight-speed Quickshift All-Wheel Drive system (4). Capable of selecting gears in just 200 milliseconds, and shifting non-sequentially, such as from 8th to 2nd gear in extreme situations, the transmission helps deliver outstanding precision and confidence with a strong torque-rich shift quality unique to this vehicle. 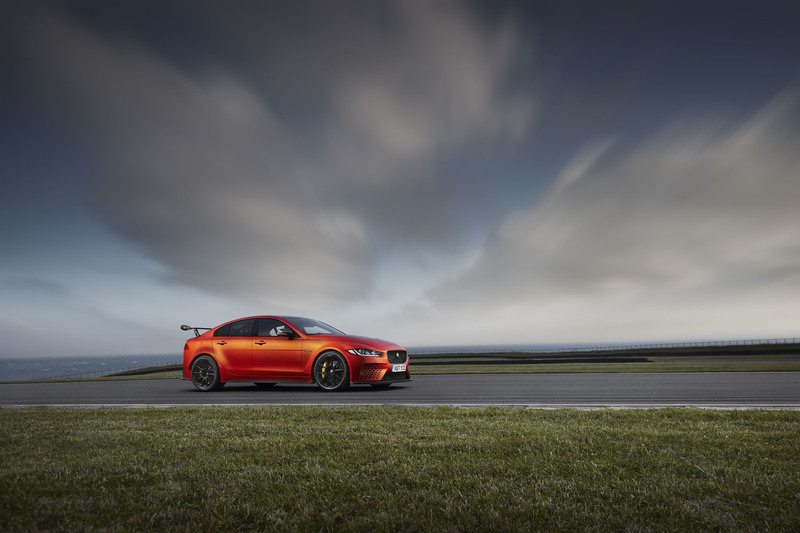 Project 8 also introduces an Electronic Active Differential (EAD) for the first time on the Jaguar XE, which works with the Intelligent Driveline Dynamics system to precisely manage torque delivery to each of the rear wheels. 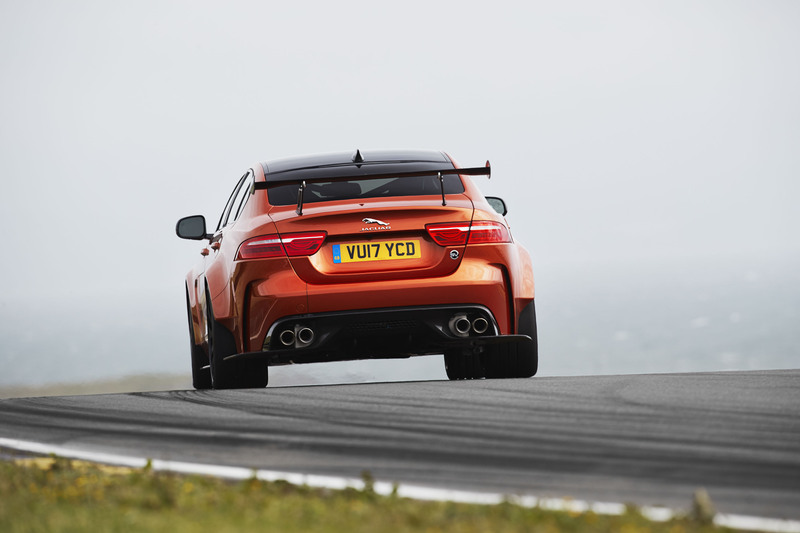 In conjunction with enhanced large diameter front and rear driveshafts, the EAD is designed to ensure optimum ability to put power and traction to the road in varying situations and contributes to the exceptional lap times achievable by the Project 8. To keep differential temperatures under control, particularly during sustained track use, the Project 8 incorporates a differential cooler housed in the rear diffuser. 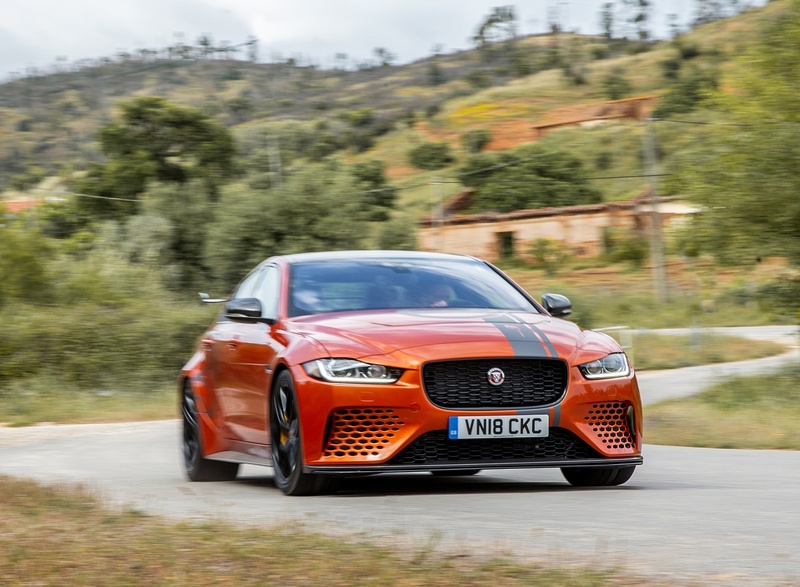 The Project 8 is also the first Jaguar to receive a dedicated Track Mode, which enhances body control and sharpens both throttle and steering responses for ultimate precision, control and driver feedback. 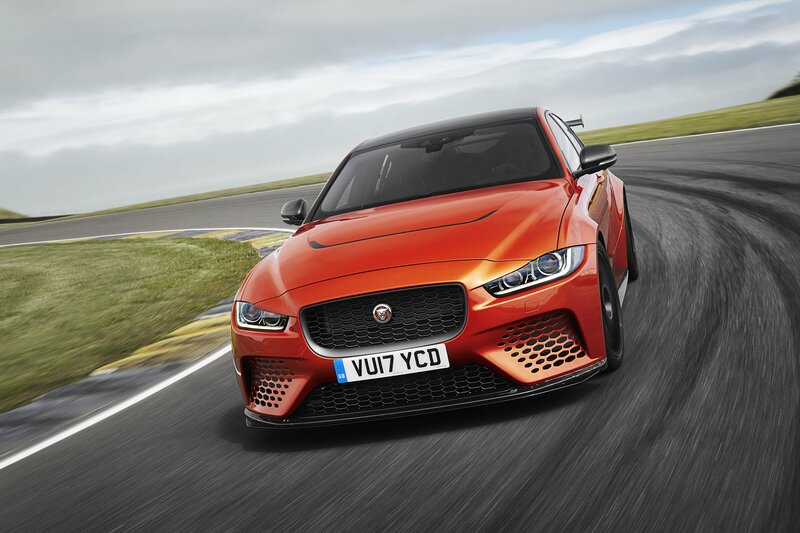 With double-wishbone front and Integral Link rear suspension, the Project 8 offers outstanding performance and poise, delivering confident handling on varying road surfaces. Complementing the powertrain and AWD system4 is an extensive range of chassis and suspension enhancements developed through an intensive test program at tracks including Nardo and the Nürburgring Nordschleife. This is the most track-biased program SVO has ever carried out. 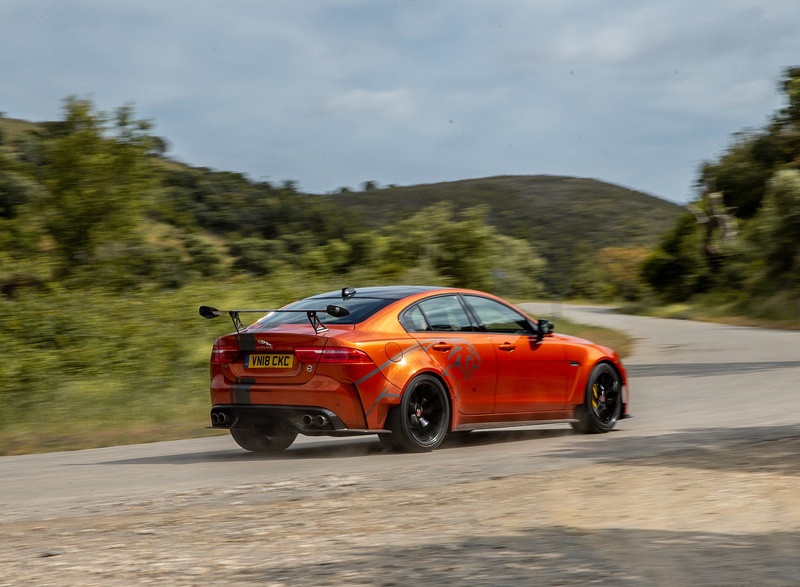 Increasing lateral stiffness is key to the range of front and rear axle modifications of the Project 8, which combine to deliver exceptional speed, precision, and cornering capability. New SVO-designed knuckles machined from billet incorporate ultra-high-performance Formula 1-style silicon nitride ceramic bearings which reduce unsprung mass by a total of 1.9-lbs/840g, increase stiffness, improve steering response and reduce friction. 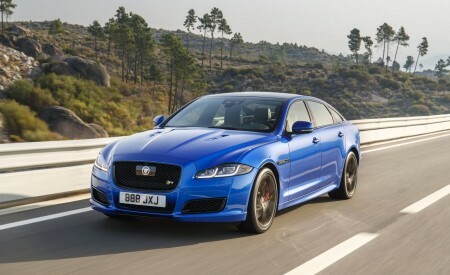 The use of ceramic bearings in this application a first for Jaguar Land Rover road cars. Stiffer suspension bushes complement the new knuckles, while the rear upper control arm assembly uses ball joints instead of bushes. 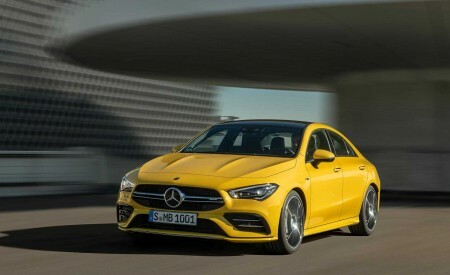 Front and rear anti-roll systems(8) are fine-tuned to enhance grip and traction, while the Electric Power Assisted Steering (EPAS) system has been recalibrated with variable damping to offer easy low speed maneuverability and precise driver feedback on track. For ultimate track performance, Project 8 features height-adjustable spring platforms with motorsport-specification coil springs and aluminum-bodied Continuously Variable Dampers and a choice of two ride heights: standard for road and -15mm for track use. 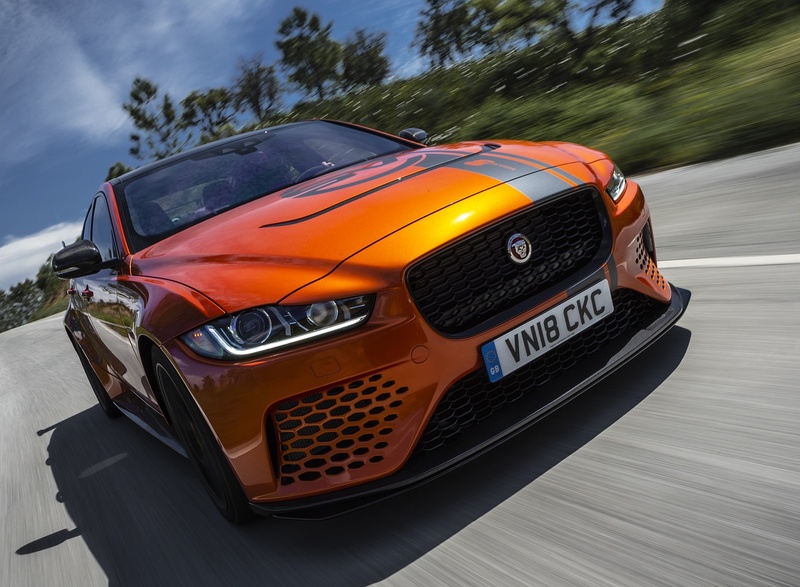 The Carbon Ceramic Brake (CCB) system fitted on the Project 8 is a first for Jaguar, offering sustained performance under demanding conditions. 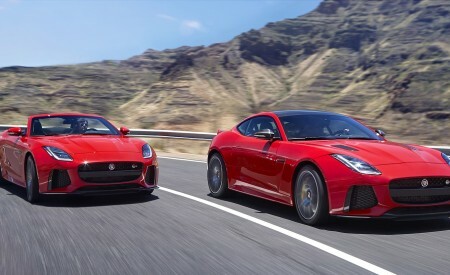 The Jaguar CCB system, which is different than the Carbon Ceramic Matrix (CCM) componentry fitted to the F-TYPE SVR, consists of 15.7-in/400mm two-piece front discs with six-piston aluminum calipers and 15.6-in/396mm two-piece rear discs with single-piston sliding calipers. The CCB system offers lower unsprung mass as well as a consistent pedal feel, fade resistance and longevity. 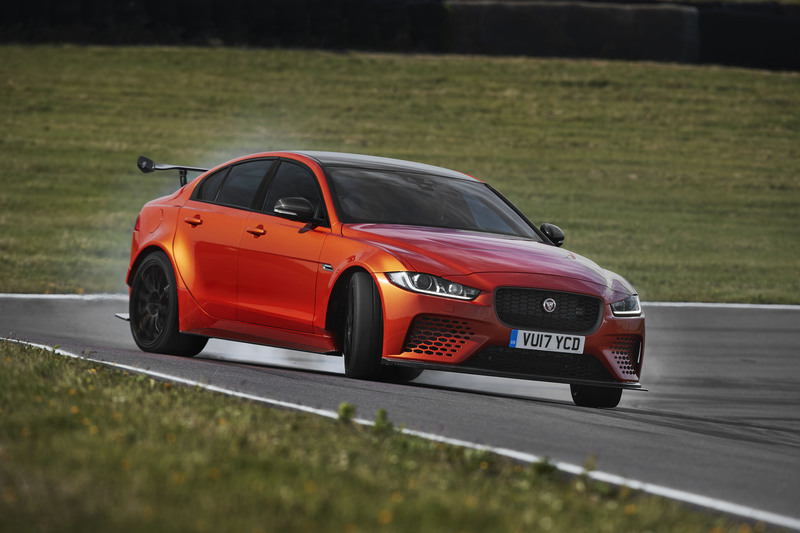 The Project 8 also uses motorsport-grade Synthetic Racing Fluid (SRF) with an exceptionally high dry boiling point, which is ideal for use under arduous braking. Torque Vectoring by Braking technology helps minimize understeer by independently braking inside wheels during cornering, and works with the Electronic Active Differential to precisely control torque delivery to the rear wheels. Selecting Track Mode activates calibration settings tailored to track use for Intelligent Driveline Dynamics, Adaptive Dynamics, Dynamic Stability Control (DSC), ABS, Torque Vectoring by Braking and EPAS systems.